With MED e-care’s NEW POC providing outstanding easy-to-manage care has never been easier. Now more accurate and person-centered. With our secure real-time mobile point of care application, you can now use a smartphone or tablet to record progress notes and daily tasks to ensure your residents well-being. Eliminate data duplication and ensure the care delivery information is up to date. Improve the Quality of Care Contact Time with our easy-to-use icon driven APP. Record Progress Notes, ADL task completion and Flow Sheets with ease. 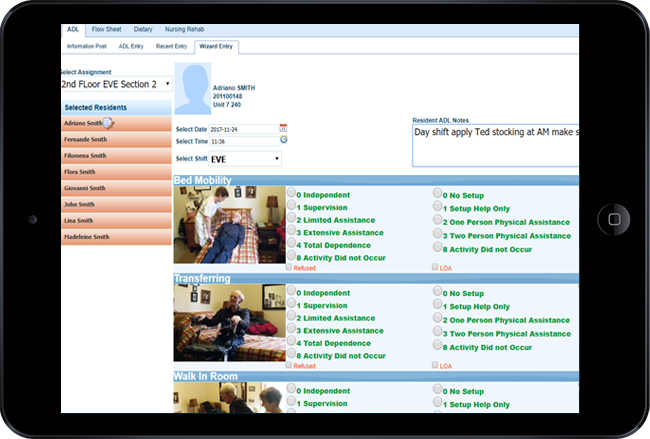 Up to date documentation of resident information at the time of care. Control access to non-care related activities and ensure all residents’ personal data is secure.